Renegade National Security Agency contractor Edward Snowden has applied to join a group of former Russian intelligence and security officials, according to the group’s director. Participation in a union of former KGB security, intelligence, and police officials, would likely change Snowden’s status from that of a whistleblower seeking to expose wrongdoing, to an intelligence defector who has changed sides. Alexei Lobarev, chairman of the group called "Veterans of the Siloviki"—literally "men of power"—told a Russian news outlet on Monday that Snowden, who has been staying in a Moscow airport transit lounge for a month, applied for membership in the group. The state-run RIA Novosti news agency reported Wednesday that the Russian Federal Migration Service issued an official paper to Snowden that will allow him to leave the transit zone of Moscow's Sheremetyevo airport as part of an agreement with the Border Guard Service. Ariel Cohen, a Russia specialist with the Heritage Foundation, said joining the former KGB officers’ group would be a significant development in the Snowden affair. "It could be a spoof or a deliberate attempt to tarry the former NSA contractor," Cohen said in an email. "However, if proven true, this puts Snowden squarely into the defector category. Whatever the whistleblower rhetoric—if indeed it is Snowden—the man is seeking to join a group whose livelihood was to spy on and harm, the United States. There is hardly a more anti-American group in Russia than ex-security officials. They would want nothing more than to coddle Snowden." Kenneth deGraffenreid, former National Security Council staff intelligence director, said Snowden’s embrace by former KGB officials is a sign the former contractor is being used as a pawn in an international program of "active measures," political operations aimed at harming the United States. "And the United States is apparently totally unequipped to address this threat," deGraffenreid said in an interview, adding that he doubts that either the FBI or CIA has any counterintelligence programs designed to thwart such anti-U.S. political operations. DeGraffenreid said Snowden, along with Army Pfc. Bradley Manning who was charged with leaking secrets to WikiLeaks, are part of a global anti-American network "that runs from Russia, to China to Iran to Venezuela to WikiLeaks and the European Union – all of whom want to do ill toward the United States." "Snowden is being used as a pawn in this and we have no ability, as we did during the Cold War, to conduct counter-active measures and political warfare," he said. Snowden earlier made political asylum requests to 21 nations and agreed to apply for temporary asylum in Russia as a way out of his current predicament. 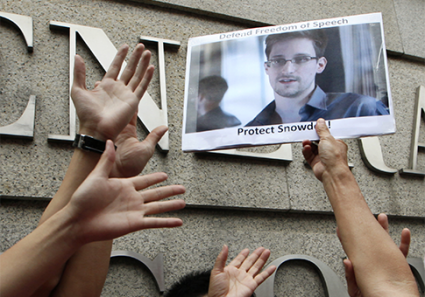 The U.S. government has pressed Moscow to return Snowden to the United States where he is wanted on espionage charges. Snowden, a former NSA contractor in charge of computer system maintenance, used his access to classified NSA networks to obtain and release highly classified documents. The documents revealed that NSA was conducting widespread surveillance on Americans’ telephone records, and Internet communications. He also revealed secret federal court orders to U.S. telecommunications companies related to electronic surveillance. Lobarev, head of the former intelligence officers’ group, told Snowden’s lawyer Anatoly Kucherena, a member of the Russian government’s President’s Human Rights Council, in a July 18 letter that Snowden formally sought membership in the group, according to the Russian business publication RBK Daily. According to the report "veteran siloviki" want to recognize Snowden as a "colleague" who formerly worked in intelligence. Additionally, the group wants to provide humanitarian support to Snowden who has been held up in the transit zone at Moscow’s Sheremetyevo airport. The former spies want to provide Snowden with a blanket, batteries, charging equipment, and if Snowden needs it, a tablet computer. "The letter arrived the other day by email at the address indicated on our organization’s website," Lobarev was quoted as telling the news outlet. In it, Snowden said he wanted to join the group and that he "needs protection." The message was signed "Edward Snowden" and the message was traced to an IP address in North Carolina. "After talks and multifaceted consultations, we determined a position on the possibility of providing help to Snowden to resolve his social and living conditions and legal aspects," Lobarev told Kucherena in a separate email. "On the basis of the principles of humanism, with regard to the former power department staffer and foreign citizen, who has found himself for a long time in a difficult situation, sleeping rough and without creature comforts, residing as he is in the neutral zone of the airport, I appeal to you with a request to pass on to Mr. Snowden at the earliest opportunity information about our readiness to provide him with the necessary assistance." Lobarev said Snowden was not prepared to be stranded in the transit lounge without basic necessities. "New clothes, a blanket, batteries for electronic equipment or charging apparatuses; perhaps he needs a tablet computer to contact relatives," Lobarev said. "We are prepared to provide him with all this, and other necessary articles." Lobarev described Snowden as a former "kollega," a term in Russian that identifies someone from the same profession but does not mean Snowden is collaborating with Russian intelligence. "We have already held a meeting with our North American counterparts, and they support us in this decision," Lobarev said. Neither Lobarev nor Kucherena could be reached for comment. Kucherena told reporters last week that Snowden’s plight is being watched closely by Russians and many have offered help. Women have offered him lodging and marriage proposals, he said, while men offered financial assistance. A spokesman for the Office of the Director of National Intelligence had no comment.